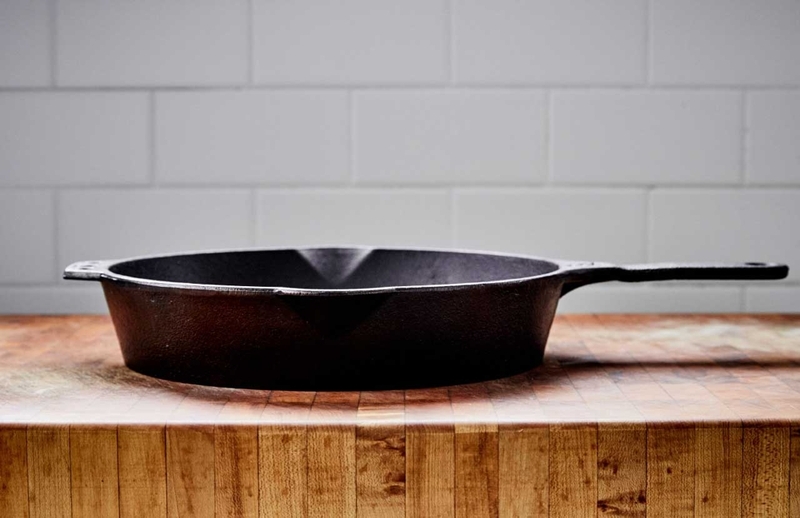 The One Pan You Need in Your Kitchen | Valet. Don't have a cast iron pan in your kitchen? Get one of these now. 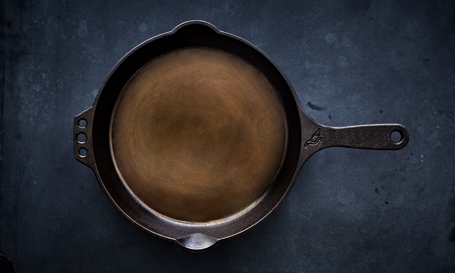 In terms of kitchen essentials, the cast iron pan is legendary and for good reason. Few other cooking vessels are nonstick enough to cook eggs, hot enough to sear anything and completely functional for roasting, simmering and baking. Plus, no other pan holds onto heat quite the same way. Instead of simply transferring heat, cast iron grabs the heat and retains it. Nathan Myhrvold, a food scientist and founder of the Cooking Lab explains it like this: "After you put a steak in contact with the pan, there's a lot of spare heat left to cook with. Cast iron doesn't drop in temperature as much as thinner pans with better conductivity," like aluminum and stainless steel. Which is why every man needs one in his kitchen. And the best ones are like a well-worn leather bag or broken-in jeans—markers of good judgement, quality and plenty of hard use. Well-cared-for vintage versions have become grail items among home cooks. And that's because new skillets are hastily made and lack the satiny smooth surface of yesteryear's pans. But there are a handful of American companies crafting new versions that are promising all the benefits of an old school cast iron skillet while adding some modern improvements. 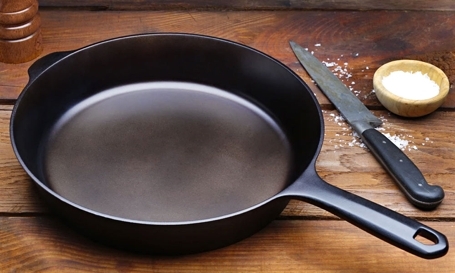 After raising a shocking $1.6 million dollars on a $30,000 Kickstarter campaign, this new brand is churning out an American-made cast iron skillet that's machined to increase smoothness and reduce weight. In fact, the unique thin-walled pan is lighter than a 13" MacBook Pro. Designed and manufactured in Charleston, South Carolina, this is one heavy duty skillet (about 6 pounds) with classic features like dual pour spouts. The more ergonomic handle is definitely nice but the super-smooth milled and polished cook surface is the real star here. 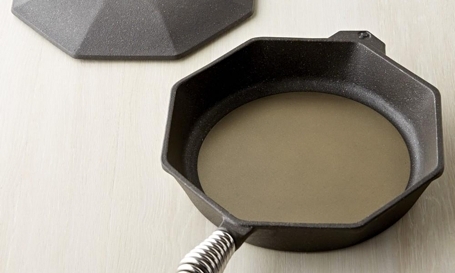 One of the first of this new generation, the Finex skillet's octagonal shape allows for multiple pouring options and easier cleanup, plus it's deeper than most cast iron skillets. The coiled spring handle is easy to hold and cools down quickly, plus the included lid has integrated self-basting rings that create ideal moisture control while cooking. 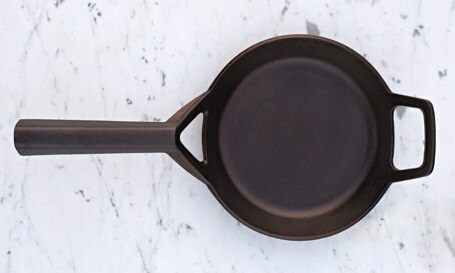 Made in Syracuse, New York from 100% recycled iron and pre-seasoned with organic flax seed oil, what we really appreciate about this sleek cast iron skillet is the minimalist modern design and the long handle which quickly dissipates heat, staying cool to the touch on the stovetop. The idea of a pan that is never washed with soap can be alarming. But it's easier than you may think. Scrape the cooking surface clean with a stiff brush, a pot scraper or coarse salt. 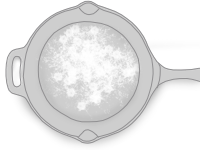 Then rinse with very hot water (and only if needed, a drop of soap) and put it back on the stovetop over low heat until completely dry. If the cooking surface looks a bit dry dab a small amount of vegetable oil on a paper towel and buff into the pan. A crazy simple kitchen hack results in a steakhouse quality meal every time. With these ten durable, no-nonsense pieces, you'll be able to master almost any dish.